Mobile Darkroom – See How One Photographer Takes His Darkroom With Him… Everywhere. The historical wet plate photo process was invented in the 1800s, and consisted of photographers coating a metal or glass plate with a chemical called collodion, immersing it in silver nitrate and then exposing the plate—which acts as a negative—in a light proof box. Although this method allowed for a much shorter exposure than previous photographic methods, it also had its limitations. Despite the focused and defined b&w still life images rendered by this process, it required a hefty amount of equipment and couldn’t capture moving action without a blur. Not to mention, these exposures also need to be done within only fifteen minutes. Now over 200 years later, the process has been revived while a solution for these issues has finally been found. And it exists on the back of a bicycle nonetheless. Douglas Nicolson is a London-based artist who has created a mobile darkroom, practicing the wet plate process but without its previous constraints. 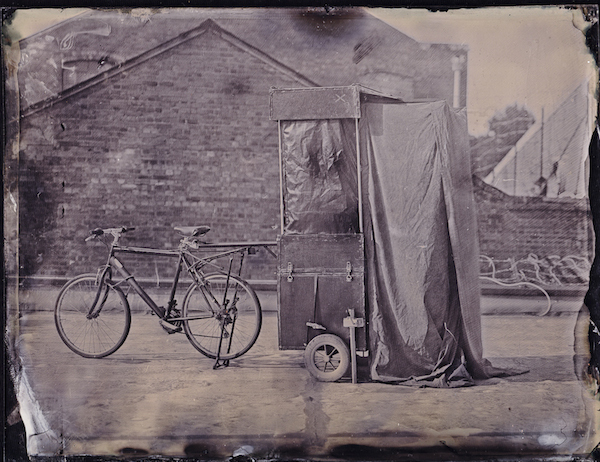 While the process requires an almost immediate exposure, Nicholson decided to build a darkroom on the back of a bicycle so photographers can immediately develop their photos. As a person who identifies as an artist, educator and researcher, Nicolson’s mobile darkrooms are part of an evolving art exhibition. He has demonstrated this process across shops and venues throughout Stoke Newington and Dalston in London during the COS Artwalk Festival last year. Nicolson was born in Scotland and earned a bachelors in visual arts from the University of Arts, London, along with a Masters in Community Art Practice from Goldsmiths University, London. Currently based in London, he has worked to create artwork with inmates in a prison in the UK, children in a Romanian homeless shelter, in addition to young offenders in East London and residents in a psychiatric hospital. Check out Nicolson’s site to learn more about his projects and mobile darkrooms!